Have you ever touched a lung? Or, what is the coolest thing a guest speaker brought into your classroom? How do you accessorize your computer? Before I get into 5 random things from my week, I wanted to wish everyone a Happy Mother's Day. I know not all of you are mothers, but it should be a special day to honor all mothers, so enjoy being honored and honoring others! (ONE) It has arrived!!! 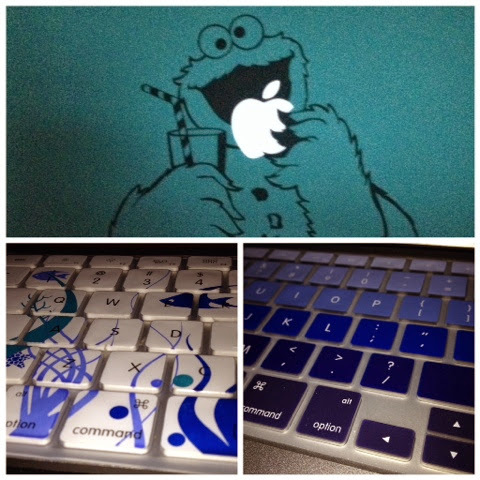 I am so excited to be able to have a Mac wherever I go!!! 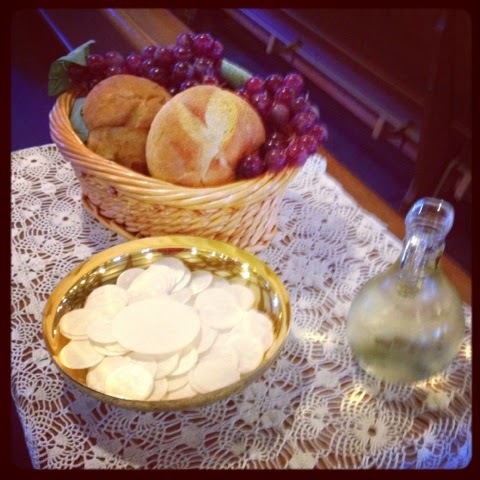 (TWO) We had a lovely day on Saturday for First Communion. I posted about it last weekend when I announced the contest winner. We also celebrate in school Wednesday with a pasta lunch for the 2nd graders and their buddies. 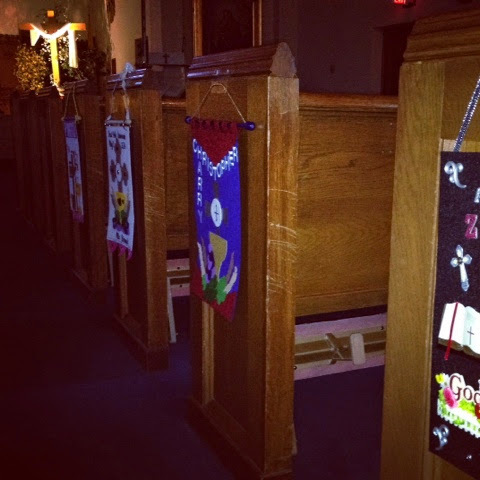 I do love communion, but I am so happy to be able to get back on schedule. 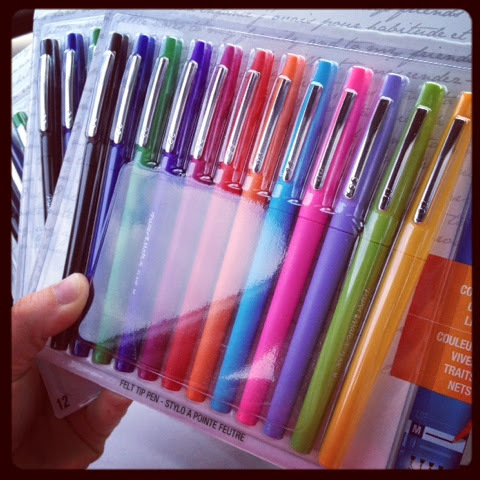 (THREE) Thank you to all of the teachers who shared about the Flair sale on Instagram. I was able to grab a few packs, at the 3rd Staples I went to. 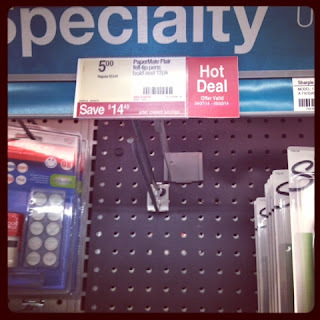 I was away and looked up Staples locations, the first went out of business, the second was out, finally success at the 3rd. Luckily they were in the direction I was headed in to go home. 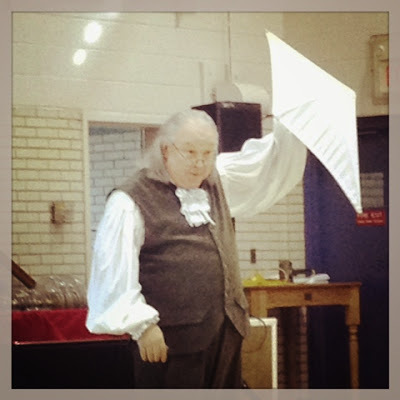 (FOUR) Ben Franklin visited our school this week. It was a great enrichment program and my students learned a lot. The loved when he showed books at the end of where you can read about him. One book was Who Is Ben Franklin and my class started giggling, looking at me, and mouthing we have that one :) I love when they get excited about books!!! 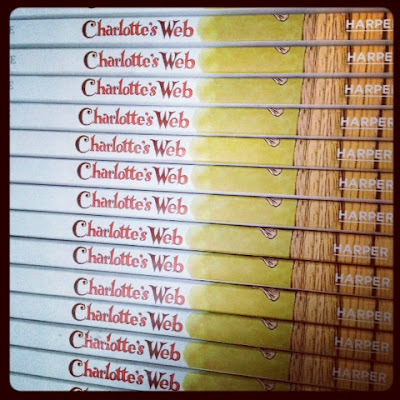 (FIVE) I love when we read Charlotte’s Web as a class. We get to start next week!!!! 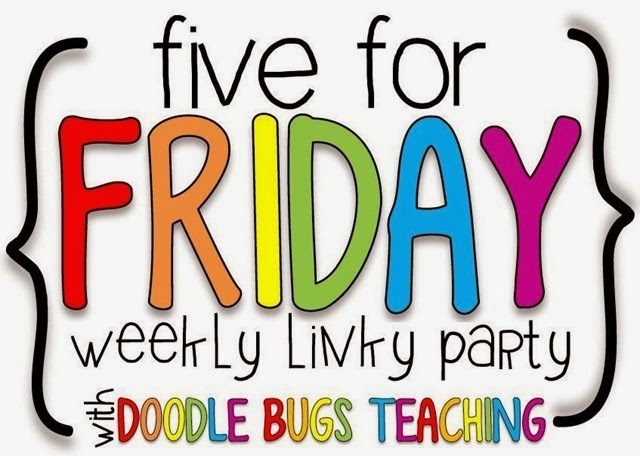 Thank you to Doodle Bugs Teaching for hosting this weekly linky, click on the picture and see what is happening in some other classrooms. I love Instagram, thanks to the lovely teachers I follow, I learned about this $5 deal at Staples on Saturday! What is your must have teacher supply? We have a winner!!!! Thank you to all who celebrated with us! We had a lot of fun getting to know so many of you through this contest, we will be sure to have another one soon. Here is the biggest reason we were celebrating, our students made their First Holy Communion this past Saturday. The children did a fabulous job! We were so proud of them. It was a beautiful day, in the church and outside. I can't post pictures of the students without covering their faces, so I don't have any to share, but they were beautiful. I also can't take pictures during the ceremony although many parents did. I can share this picture of my "niece". 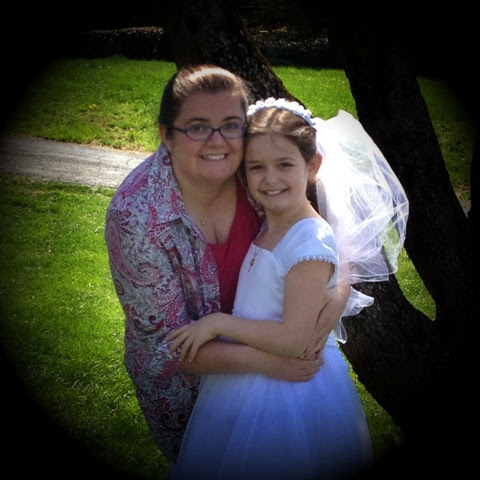 I missed her First Communion because I was at the one for my students, but I did join her after. We had a lovely time, and you get to see one lovely First Communicant. So once again thank you for celebrating with us, and Ashlee we will be talking to you soon. 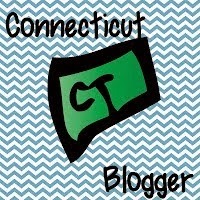 Don't forget to stop by Ashlee's blog, she is holding her own contest right now! 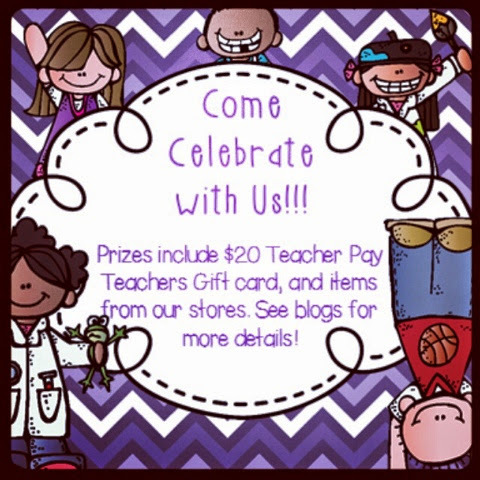 So visit Teacher Will Run for Books to enter! Five For Friday- May already?!? Friday, already?!? May, already?!? This week, no this year has flown by, but I wanted to link up with Doodle Bugs Teaching and share 5 random things from this week. one... My first rafflecopter contest is drawing to a close this weekend. If you would like to enter click the picture to the post about it and scroll down. It has been a blast getting to interact with so many new people. 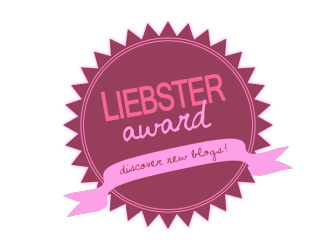 I am honored to be able to create this contest with my grade partner, she has really helped me enter the world of blogging and Teachers Pay Teachers. I am loving every minute of it! two... First Communion is tomorrow, it is the peak of a mountain we have been climbing for a long time now. The climb is defiantly worth it to see such a special day in the lives of my students. I love how proud they are of themselves, and they deserve it, we have been working so hard! I am sure next week I will be telling you all about how it went. I may even blog about it tomorrow! three... Yes, that is a camel, no it is not real, although one of my Facebook friends thought it was. 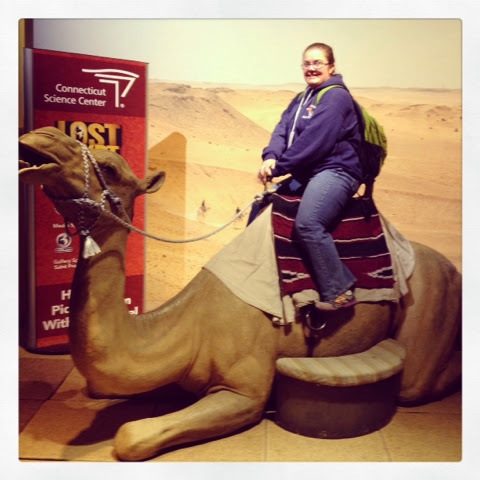 It is a camel at the Connecticut Science Center, it is part of the Egypt display they have there this month. The second grade classes went there on Wednesday, and we had so much fun! I have never taken a class there, and I was a little nervous because it is a long bus ride and the place is huge. We had 4 students to a chaperone and that was perfect. They really interacted with the students in their group and explored at their own pace which is perfect for the Science Center. It is a great hands on learning experience and I just may have to bring some more kids up this summer. I wish I could share more pictures but with blurring their faces you lose what made the picture special. The looks on their faces all day were priceless! four... I ordered my new laptop this week. 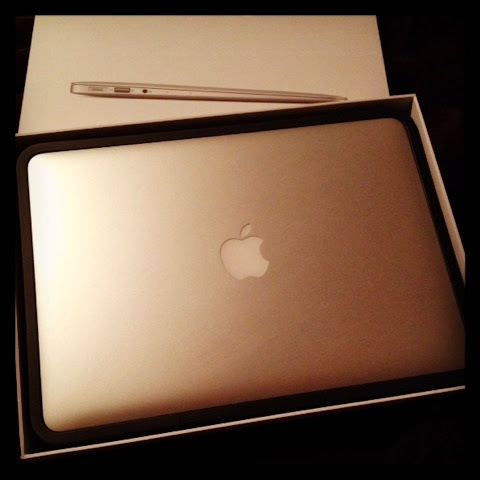 Apple just updated their Macbook Air so I ordered it. I have been watching for them to update it, and I have been saving my money. I was expecting it in June, and was so excited when they did it this week! Now I just have to wait for the delivery date of May 12th. five... 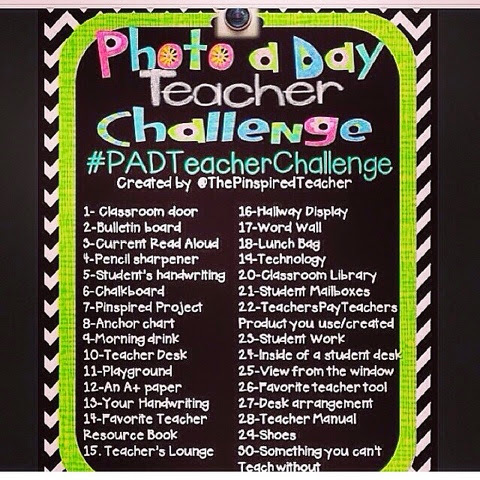 I saw this photo challenge for the month of May so I figured I would give it a shot! I love trying these, although I have never made it the complete month. If you want to see what I post make sure to follow my Instagram account on the sidebar, my user name is sarabeth781. I think it will be a lot of fun. I'm sorry that I don't have a lot of pictures to share this week, but we were really busy with First Communion practice. Hopefully next week will have more pictures. 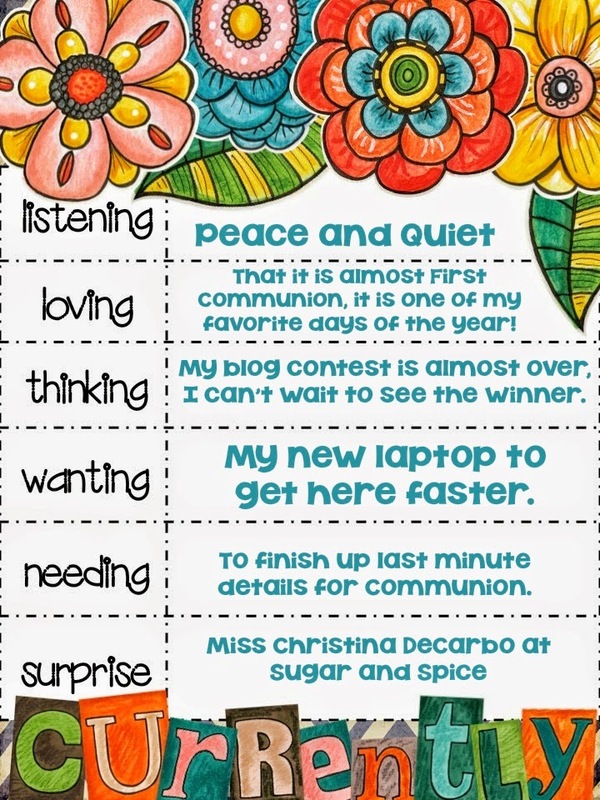 Once again thank you to Doodlebugs Teaching for hosting this linky. You can click on the image below to go see what others have been up to this week. It must be May there is a new Currently out!!!! This has quickly become my favorite part of starting a new month. Thinking... I have had so much fun running my first rafflecopter, I can't wait to see who wins. I will defiantly be doing more in the future, it is a great way to get to know some other teachers in this blogging world. The best part is I teamed up with my grade partner. If you would like to enter click on the picture and it will take you to the post about the contest, the raffle is at the bottom. Wanting...Apple came out with an update Macbook Air on the 29th, so I ordered it. It says it will be here on May 12th, can't it be here like NOW!!! I am so excited I have been saving up for it and waiting for it to come up on the product cycle. Needing...There is always a detail or 2 that turn up before communion, I just have to remember not to panic and go with the flow. Everything will be fine, just work one detail at a time. Tomorrow morning it will be folding the programs, organizing the gifts, and something else that I am forgetting but it will come to me! Surprise... I would like to surprise Miss Cristina DeCarbo at Sugar and Spice. 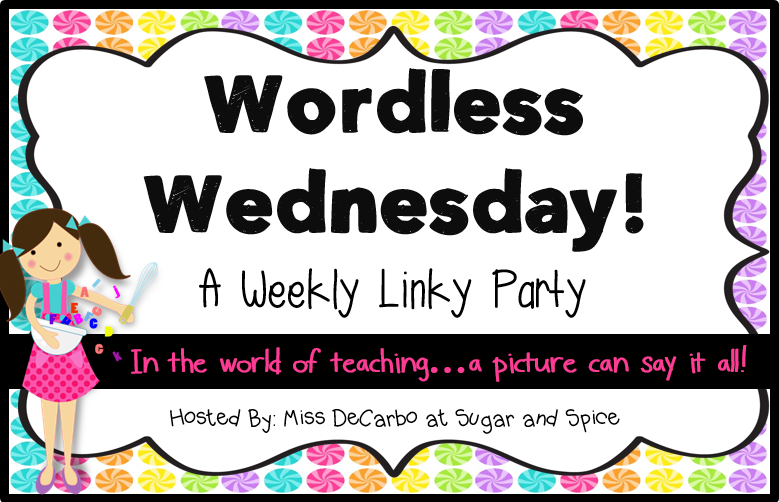 The reason is she has started a wonderful weekly linky party called Wordless Wednesday. I love this because it offers a snapshot and discussion about a classroom, a blogger, or life. I learn so much about those who participate. It is a quick connect with so many people and I really enjoy it. So Christina if you are reading this, thank you for this great idea and organizing this linky. I am honored to be a part of it. 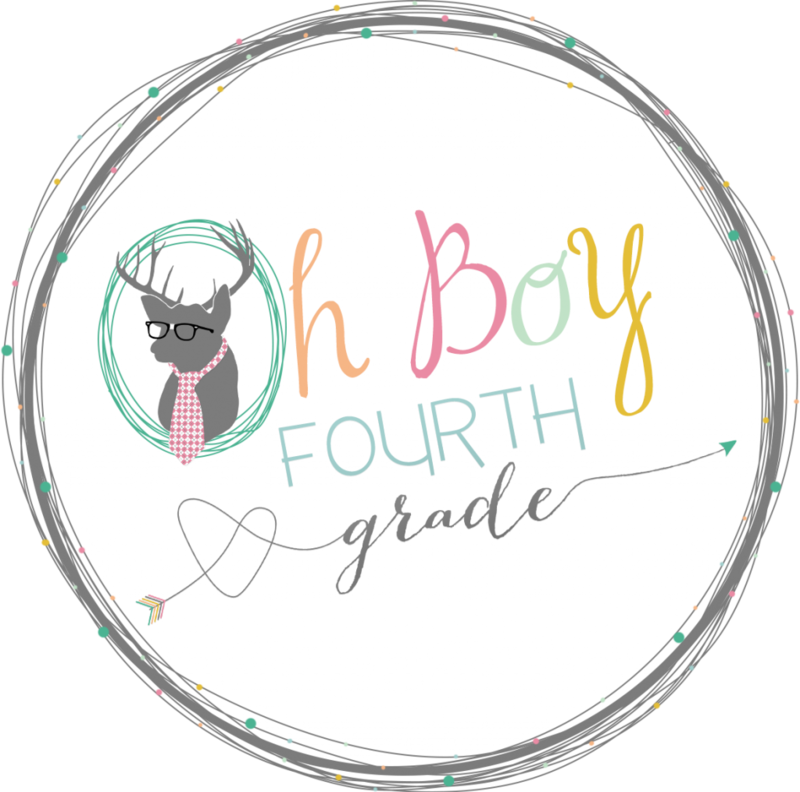 Thank you to Farley over at Oh' Boy 4th Grade for hosting this wonderful Currently, I love participating each month. Click on the picture to see what others are posting in this months Currently.